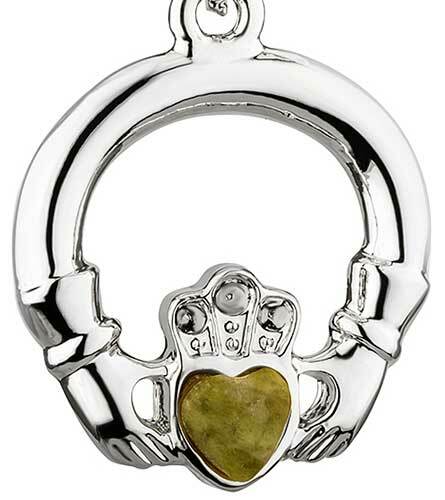 Claddagh necklace is a rhodium plated design that features a Connemara marble heart. The Connemara marble that is featured in this Claddagh necklace is the only natural green marble in the world; fittingly, Connemara marble is only found in Ireland. This rhodium plated Connemara marble Claddagh necklace features Ireland's green gem stone in the heart along with embossed detailing on the crown. 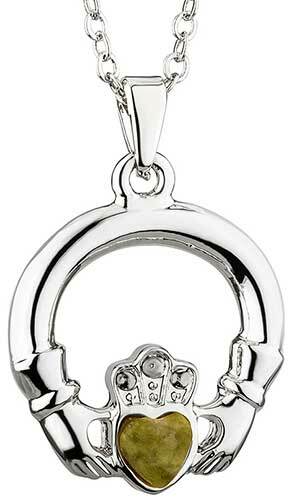 The Claddagh necklace, with inlaid Connemara marble measures 3/4” wide x 1" tall, including the jump ring and the chain bail, and it includes an 18” long rhodium plated chain. This Connemara marble necklace, like all the Irish made jewelry at The Irish Gift House, is nickel free and hypoallergenic. Claddagh earrings feature Connemara marble hearts and a rhodium plating finish. Claddagh necklace features a Connemara marble heart along with rhodium plated finish.